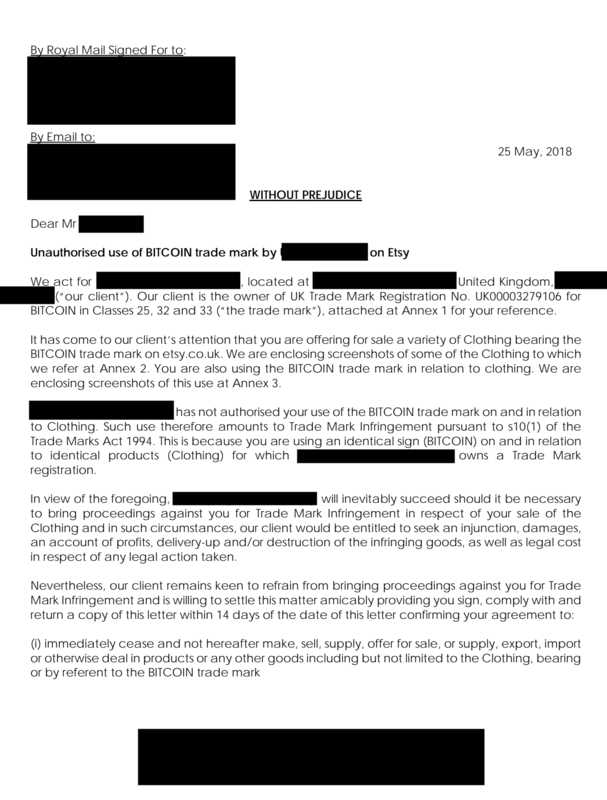 It has come to our client’s attention that you are offering for sale a variety of clothing bearing the Bitcoin trademark on Etsy.co.uk. [Our Client] has not authorised your use of the Bitcoin trademark on and in relation to clothing. Such use, therefore, amounts to trademark infringement pursuant to s10(1) of the Trade Marks Act 1994. Contacting the company is difficult as there is very little information on the London-headquartered firm called IP-Holdings — minus one other patented IP product called ‘Westworld.’ The trademark itself, filed this past December, reveals a list of goods that can’t bear the name without permission such as adult clothing, infants’ clothing, shoes, headbands, socks, and nearly everything that can be manufactured into a product. Trademark number ‘UK00003279106 Bitcoin’ was officially registered into the IPO’s records on April 13, 2018. The UK filing seems to be the first successful trademark using the name Bitcoin as there have been other undertakings in the past. Back in March of 2015, the United States Patent and Trademark Office (PTO) rejected the company Urban Trend’sattempt to trademark the name Bitcoin (Reg 86135516). A year later during the same month, the Russian patent agency Rospatent denied the Moscow-based firm M-Group when it tried to copyright the Bitcoin name. Many cryptocurrency enthusiasts have been angry about the recent news as prior attempts have infuriated bitcoiners in the past. Back in 2015 the nonprofit organization the Bitcoin Foundation published a plea to individuals and businesses asking them not to copyright the term Bitcoin. “The Bitcoin Foundation believes that the term “Bitcoin” alone should not be the intellectual property of any individual or entity,” explained the organization back in January 2015. What do you think about the UK company trademarking the name Bitcoin and sending cease and desist letters to those who attempt to use the name? Let us know your thoughts on this subject in the comment section below. Images via Pixabay, Wiki Commons, and the Intellectual Property Office UK.